That’s what I call a deal: Irvine Regional Park for $1! Best deal that Orange County ever made- $1 for Irvine National Park! Afer 14 years of visitng Southern California, it’s always exciting to discover new places to visit. This last Thanksgiving, we visited the 477 acre Irvine Regional Park with almost 30 family members. 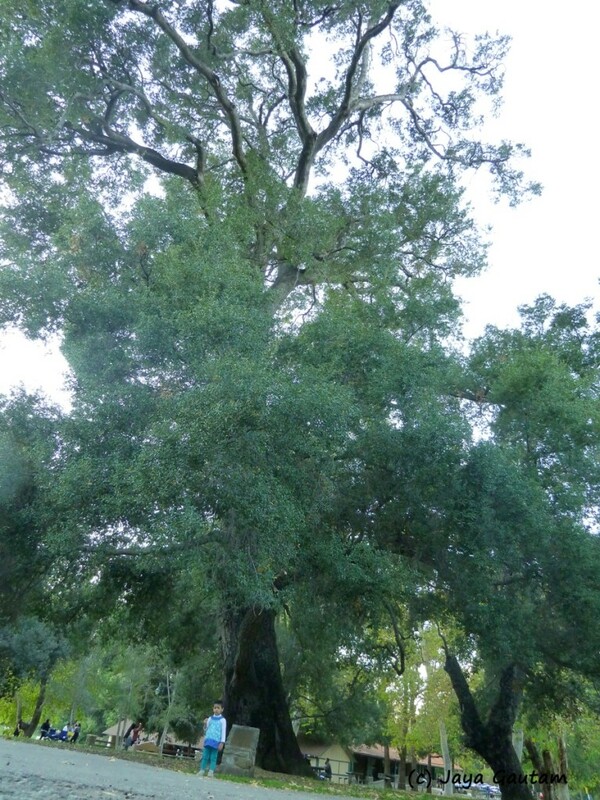 With some of the oldest Coast Live Oaks in Orange County, a history which includes operating as an army post in WWII and attractions like the boating lake, horse and pony rides, group picnic areas, playgrounds, horseshoe pits etc. It has something for everyone, from the older visitors to the youngest! 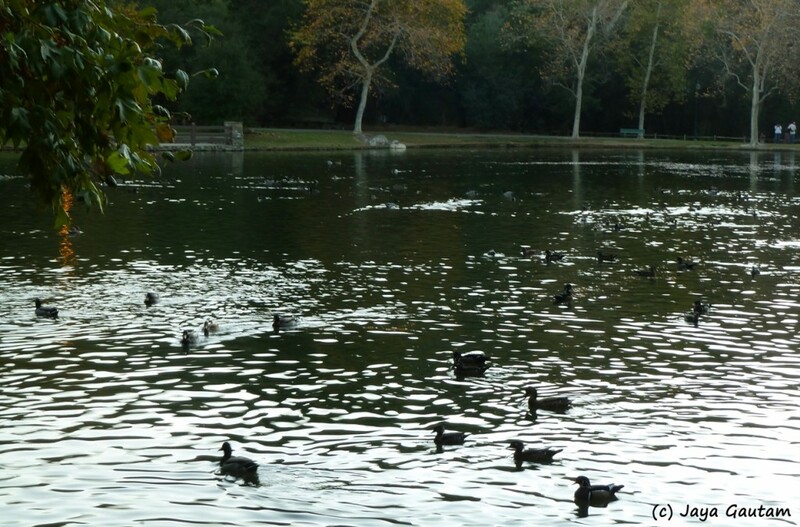 A not that well known gem outside So Cal, the Park grew out of the 160 acre oak grove, the so-called “Picnic Grounds” donated to the County by James Irvine Jr. on October 5, 1897 and named Orange County Park. The name was officially changed to Irvine Park in 1928. The first recreational use of the oak grove was by the early German colonists who settled Anaheim in 1857, and the area became known as the “Picnic Grounds”. As the nearby communities grew, the “Picnic Grounds” became a mecca for valley dwellers, and festivities were organized on May Day and the Fourth of July. The park is listed on the National Registry of Historic Places. 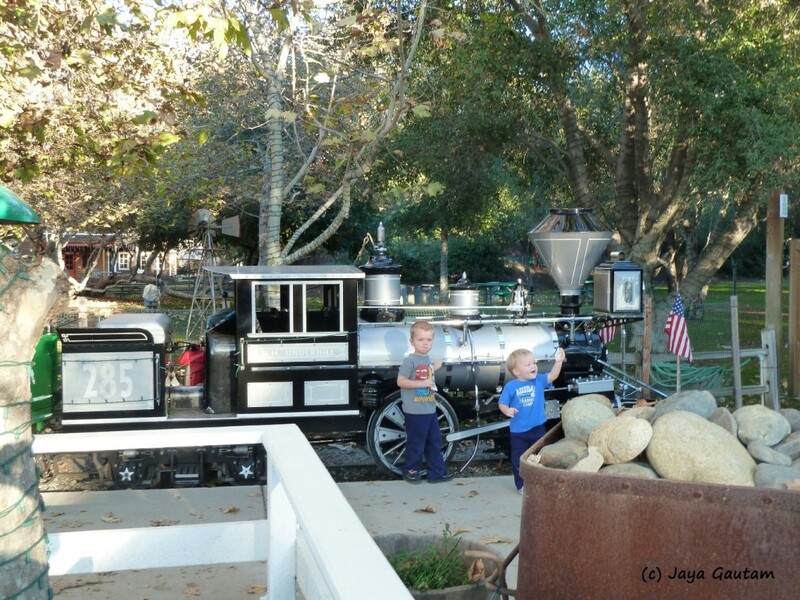 The children are sure to love riding on the miniature railroad with a quarter-mile track. 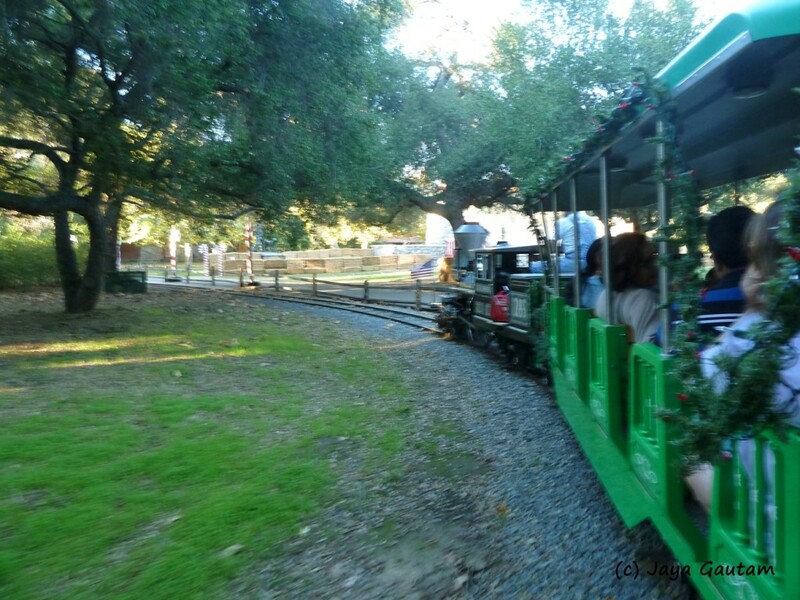 The trains leave from the “Irvine Park Depot (Pop. 5 or 6)”. 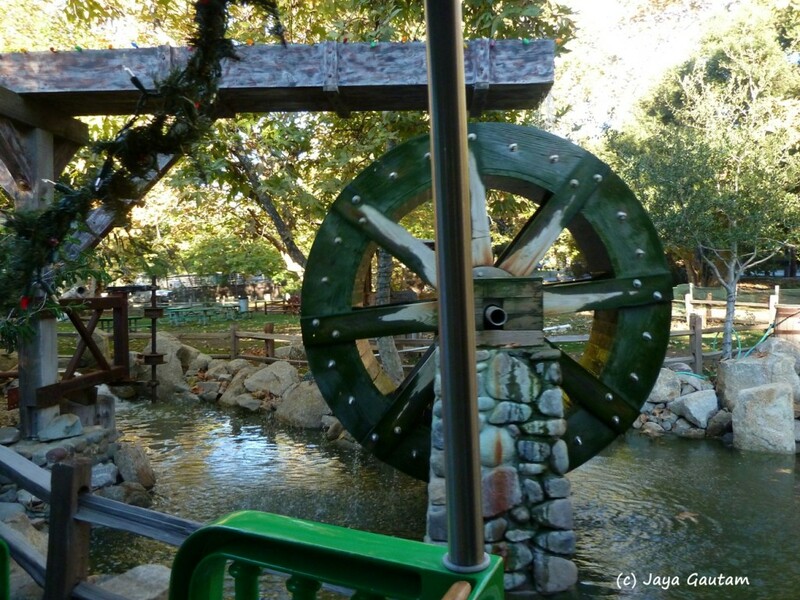 Winding around the park, you see the water wheel, the lake, the stables, picnic areas, the sports areas etc. 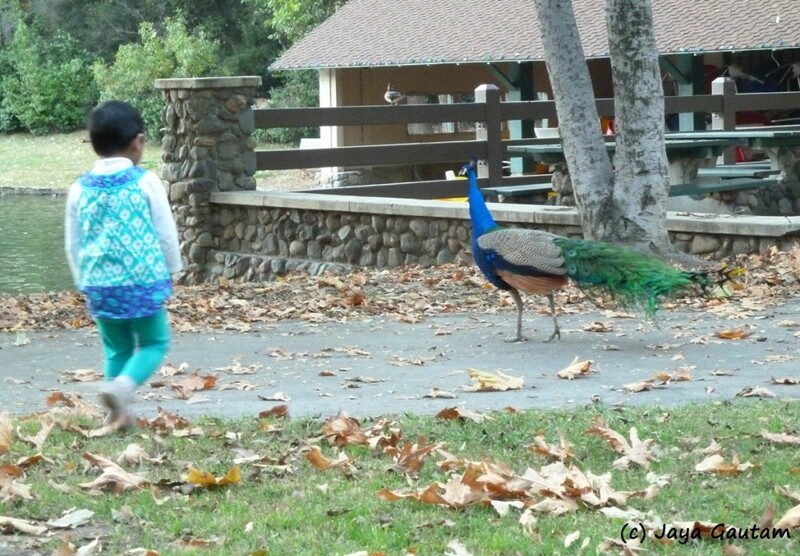 My daughter especially enjoyed the peacocks which roam all over the park. I had to firmly discourage her from chasing them! She also enjoyed the ducks and boats, the train ride and was especially enamored of the zoo. Maybe because she got her own colorful peacock zoo badge! 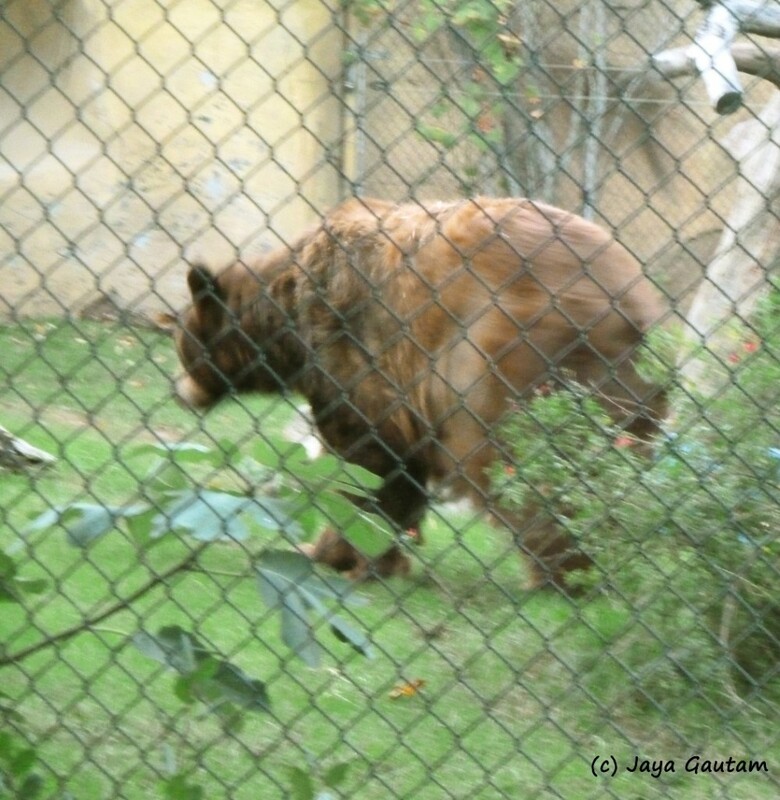 Special tip of the hat: To the zoo person at the entrance who said the zoo was closed when I reached the entrance 5 mins. before closing but let us in for an extra 10- 15 minutes beyond the close when I mentioned we were visiting from out of town and how disappointed my daughter would be! Most people, in a hurry to close up, will not wait even a minute beyond official closing time. So, kudos to you, I didn’t get your name but I should have! 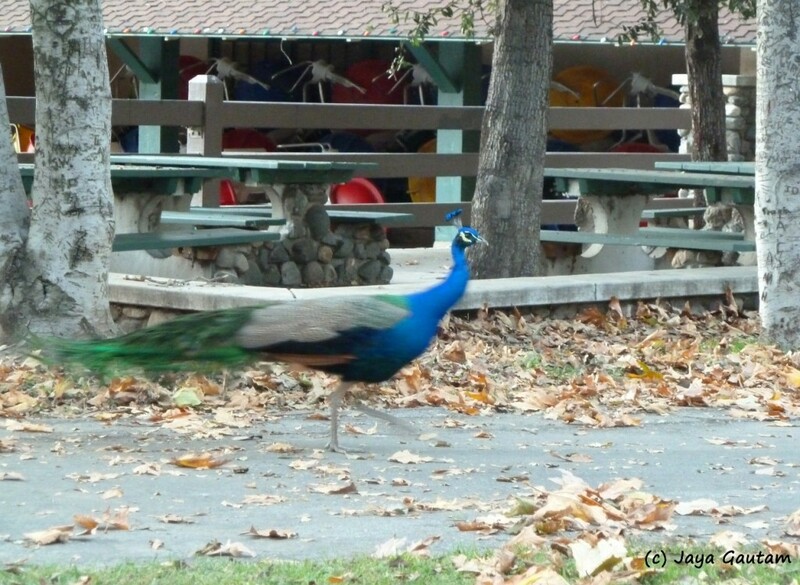 The zoo includes a children’s barnyard area and native animal exhibits. We didn’t get time to visit the barnyard area (see reason above) but loved the native animal exhibits- grizzly bears, bald eagles, golden eagles, hawks, reptiles … and a sleeping fox all curled up with its tail covering its nose! 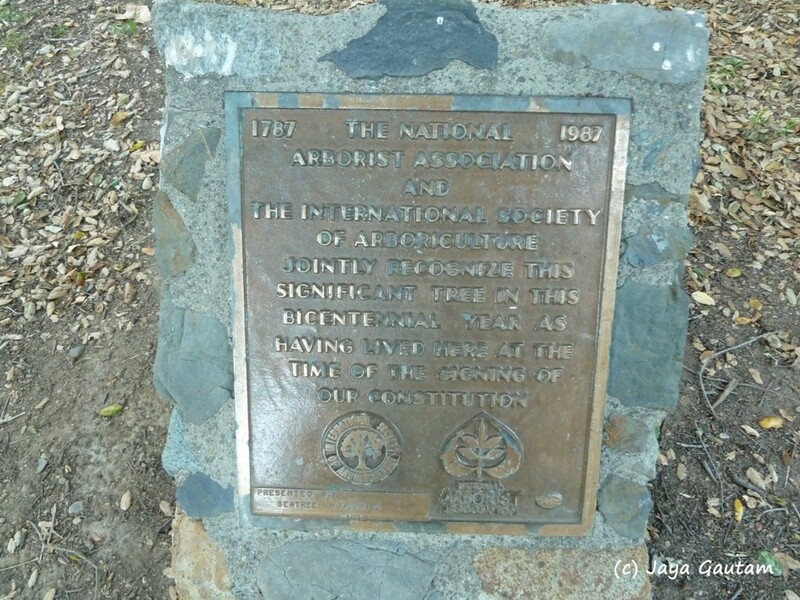 I was especially fascinated that some of the trees at the park have been around since the signing of the Constitution in 1787. Meanwhile, the rest of the family enjoyed an intensive game or two of soccer on the park grounds. Many of the kids had wanted to ride the horses (riding is offered at the stables) but we reached late in the afternoon and couldn’t get to do everything. My advice: come early in the day, picnic there and get to enjoy all the Park has to offer! School’s starting up, where’s your supply list?